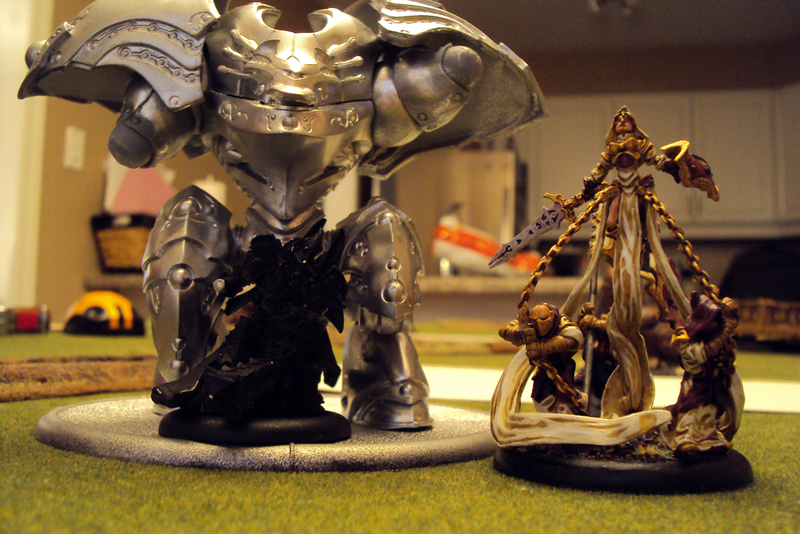 Battle 032 – 50pts Menoth vs Skorne, Harby vs eXerxis: Couldn’t Find a Rhino, so Rode a Hyperion! Two asymetrical zones, one friendly one enemy. 1CP for Dominating friendly zone, controlling enemy zone, or destroying Objective. 2CPs for Dominating Enemy zone. Up to 3CPs possible in a single turn. I won initiative and chose to go first. 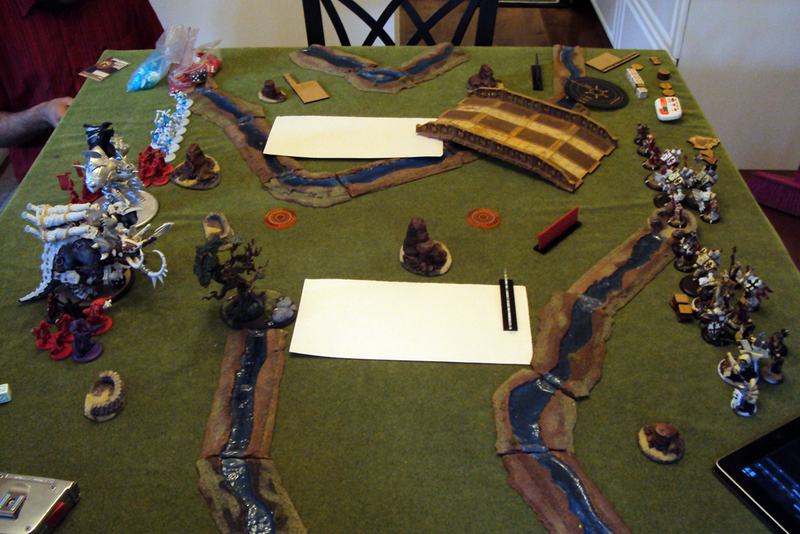 Kassem took the side of the table with slightly less table-choking terrain on it (although the table was pretty choked with terrain). Lots of long range punch, with the Krea in there to make sure the shots hit. Add to that the wrecking-ball that is Xerxis himself, and a potent combination! Tier Benefits: 5 Wall Templates that can be placed before Deployment, cheaper Heavies without ranged weapons, +1 Paladin FA for every unit, and +1 starting roll. Great tier, lot of fun to put on the table, and a legitimate threat to many armies. Armies that can slow down my approach (the Haleys, the Dennys, Baldur, etc…) or spam out Rough Terrain (Earthbreakers, Gun Carriages, etc…) make the list SUPER-sad, but if your opponent doesn’t have a LOT of magic weapons available they’re going to be in a rough spot. 1. Can you remember to activate your Hierophant first? 2. Can you remember to activate your Choir immediately after that? If “yes”, you’ll do fine. First, I put walls up: one at the back of my friendly zone, another near the middle. To be honest, MOST of the time I find the walls to be more of a hindrance then utility, since I can’t charge any of my models over them… but to keep the Harbinger safe, I figured that those 2 would be useful. 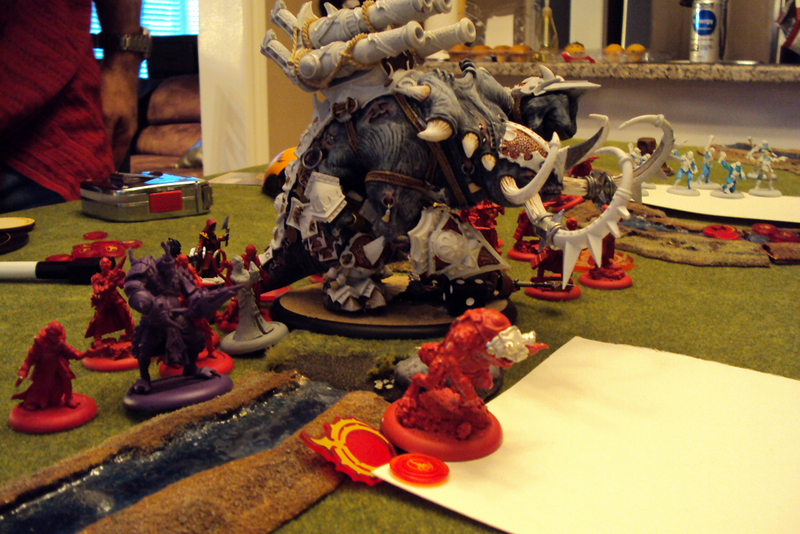 Mammoth and Xerxis dropped to the left and right of center on Kassem’s side. 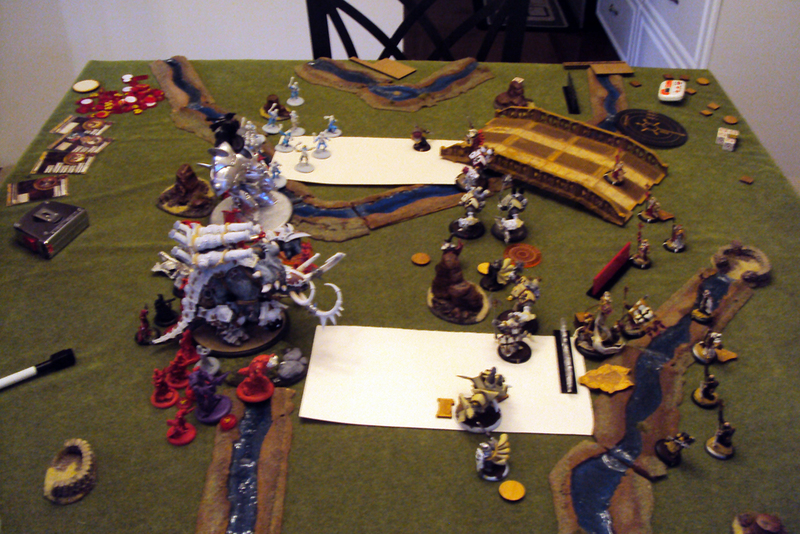 My deployment saw the Avatar, the Devout, and the Harbinger take the opposite side of the table as Xerxis (hoping to keep the Harbinger safe from the Mammoth would be easier than from Xerxis, I figured), with 2 Crusaders and the Templar opposite Kassem’s Warlock. The Paladins all scattered about equa-distance, with Vilmon and the last Crusader near the middle. 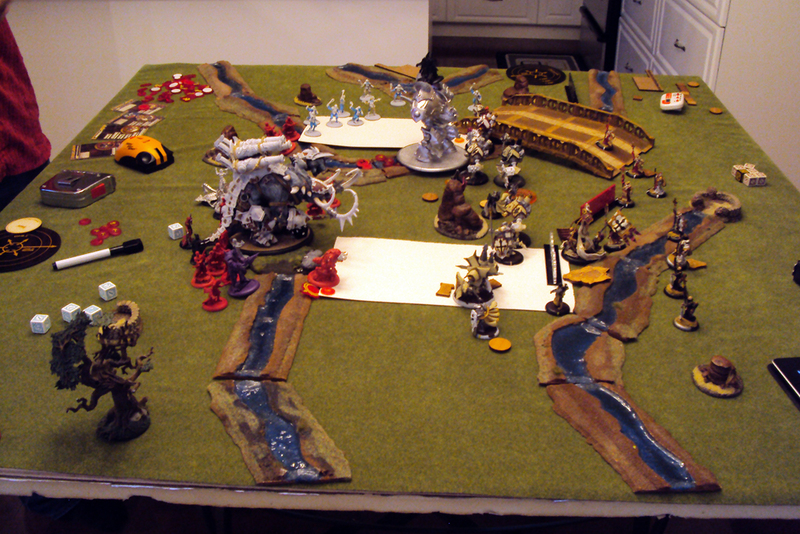 Kassem’s deployment had the Catapult crew between the two huge bases, the Raider and the Krea over by the Mammoth with the Extoller, the Reivers around Xerxis, and the Slingers on the far right. 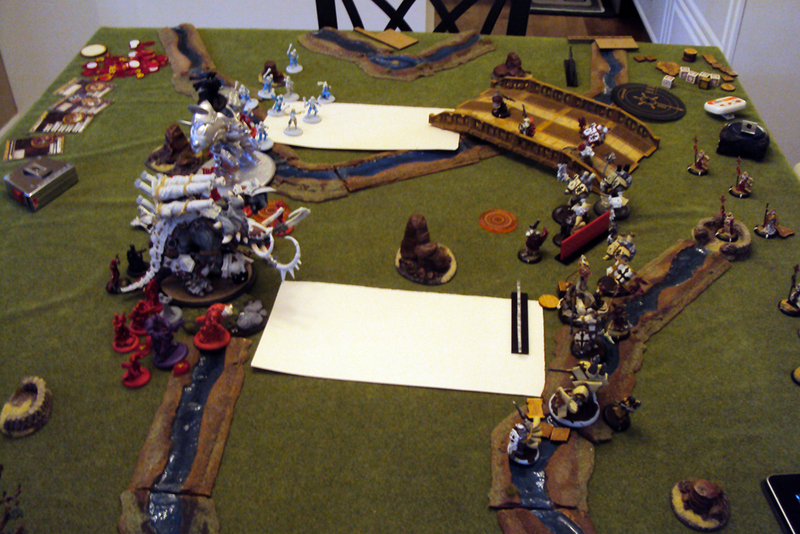 Pretty straight forward turn: the Harbinger allocates 1 to each of her heavy warjacks, and 2 to the Devout. The Avatar generates 4 Focus, as is traditional at the top of Turn 1. 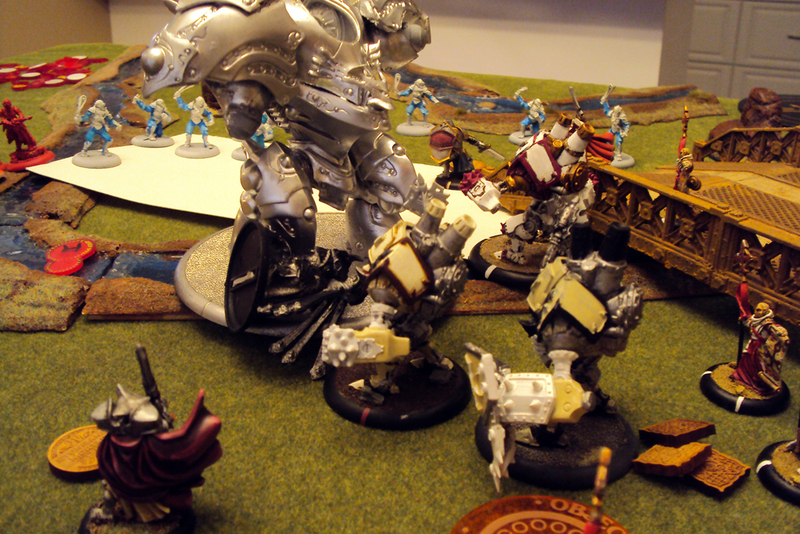 The Choir shuffle forward and sing “No Shooting” on my warjacks. 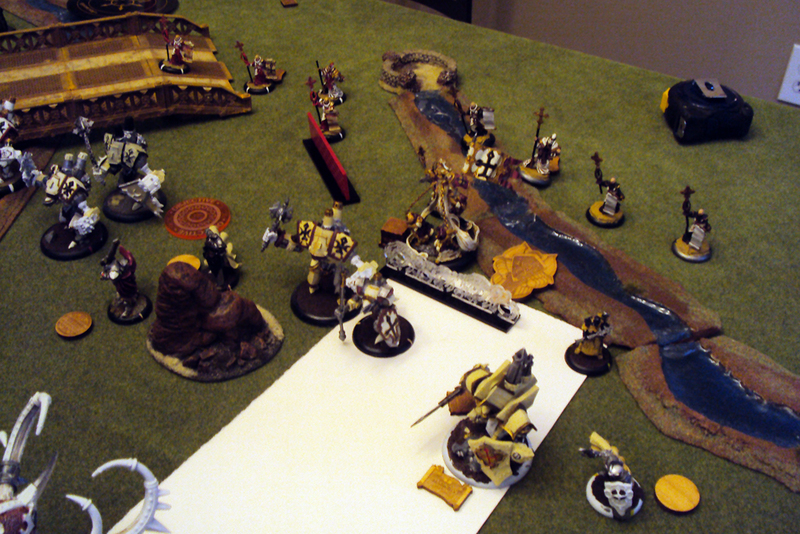 The Paladins all run forward, slowed down by terrain all over the freakin’ place. 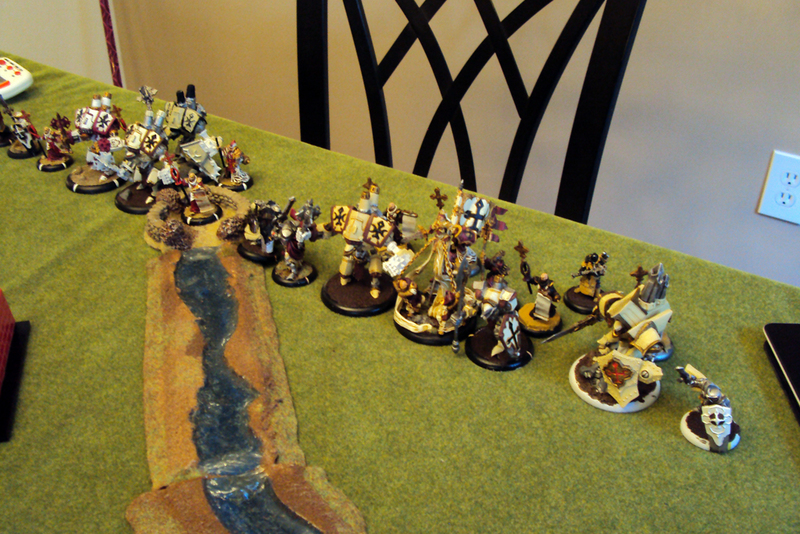 My Crusaders and Templar run forward, heading towards Xerxis. The Avatar uses “Gaze” and then runs forward. The Devout uses “Spell Barrier” and then runs forward, followed by the Harbinger, who also runs forward. Lastly, the Hierophant and Vassal both run, with the Vassal staying B2B with the Avatar. 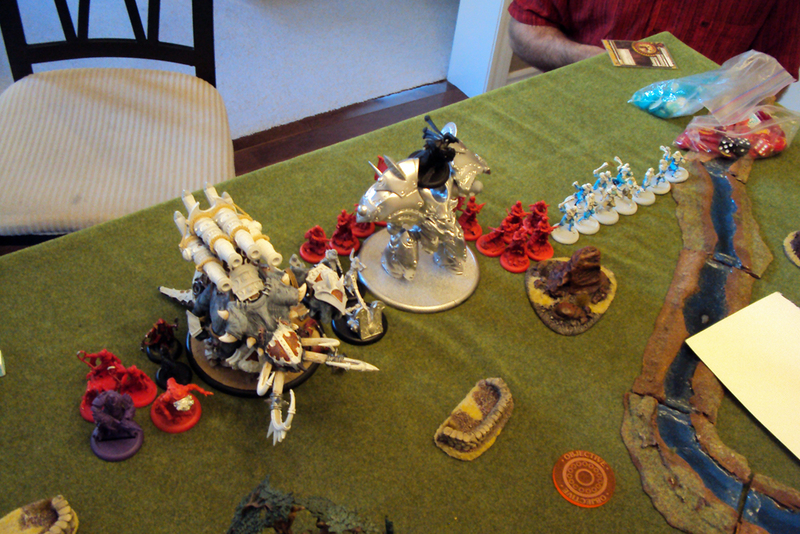 – Xerxis charges forward after putting “Farstrike” (for free) on the Mammoth. – Mammoth runs forward. He gets Ancillary Attack from the Willbreaker. It misses, but hits a few things with blast. Nothing is harmed. No guns, so another simple turn. 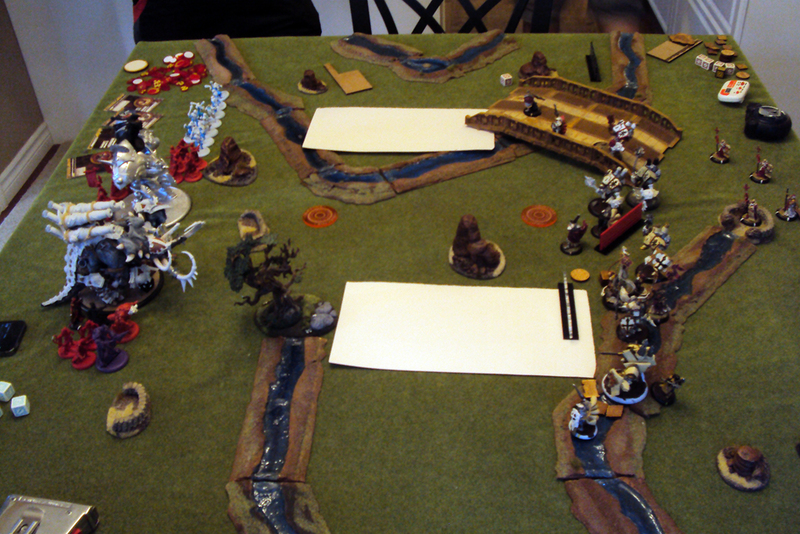 – Harby gives 1 Focus to each warjack, Avatar generates 2. – Both Choir walk forward and sing “No Shooting” on my warjacks. – Avatar uses “Gaze” and then runs. – Devout says “No Spells” on Harbinger and then walks forward. – Harbinger stays within 2″ of Devout and behind a wall. She then pops her Feat. 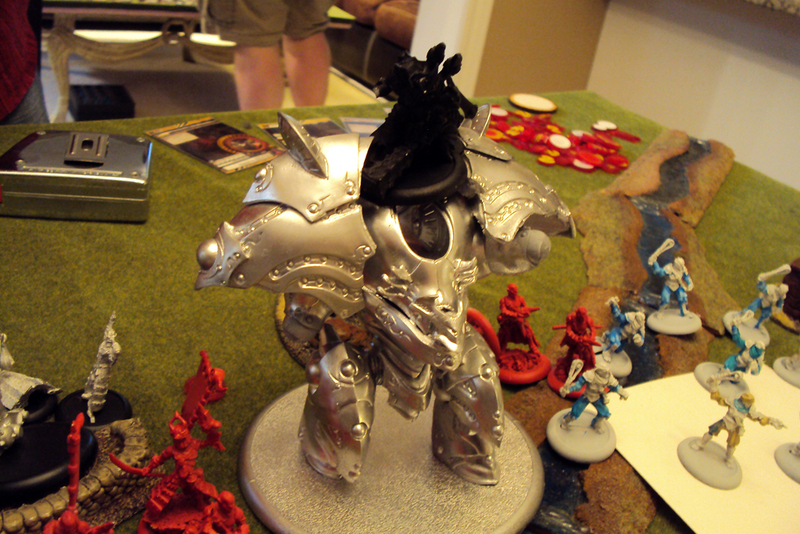 Kassem looks at the table and wonders aloud if he can destroy all 6 of my warjacks this turn. I look at the table and ask him if he’s gone off his medication again. – Xerxis goes first. He puts Farstrike on the Mammoth again, and then declares a Charge against my Templar behind my 2 Crusaders. 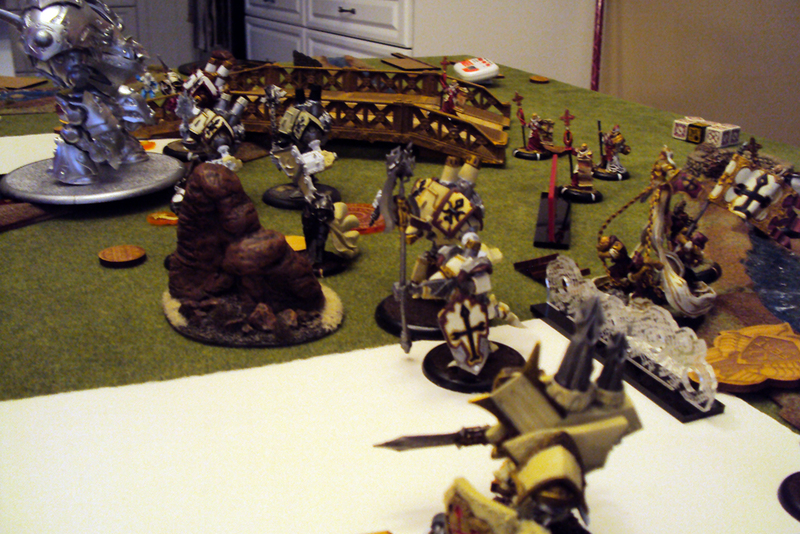 Impact attacks on both Crusaders knock them down, but sadly (for him) he’s out of melee range of my Templar. He also takes 2 points of damage from the Feat. – Extoller gives Eyeless Sight to Krea. 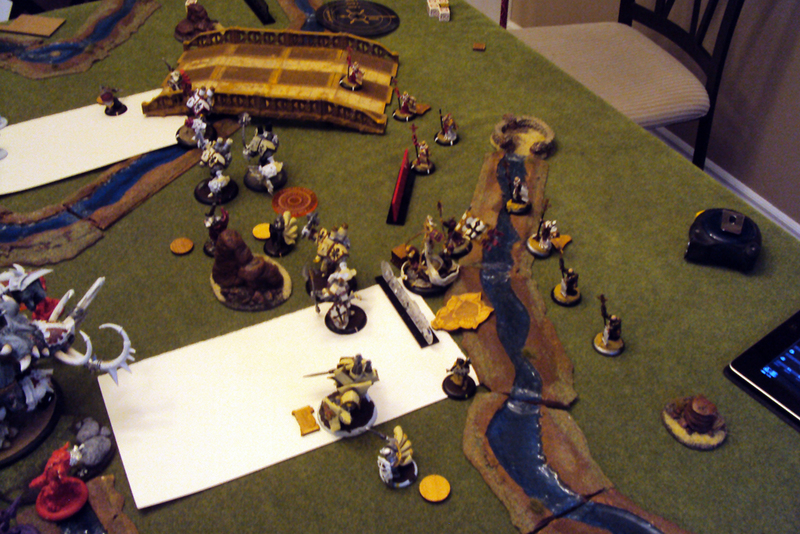 – Krea moves up (no Feat-damage) and attempts to shoot the Harbinger: She’s DEF18 behind her wall. “Eyeless Sight ignores walls”, claims Kassem. He is wrong: it ignores Stealth, clouds, and concealment, but not Cover. Needing a 13 to hit, the Krea misses. – The Mammoth aims and fires on the Harbinger. First shot (needing 13) boosts and hits: I shield-guard it off to my Devout. Second shot hits and inflicts moderate damage, last shot misses and scatters away. – Reivers go next. They aim and pop their mini-Feat to get the extra range. 3 take a shot at the Harbinger, but the bolts fly wide. The rest of the unit are out of range..
– Everything else stands still, and Kassem’s turn. Kassem is in the uneviable position of having 4 Transfers on Xerxis, but also having him in B2B with 2 Crusaders (both fully functional) and a Templar nearby. I think that’s probably enough to get the job done, and I allocate full 3 Focus to each of those warjacks. The Avatar generates 3. – Choir moves up and sings “Battle” on my warjacks engaging his warlock. 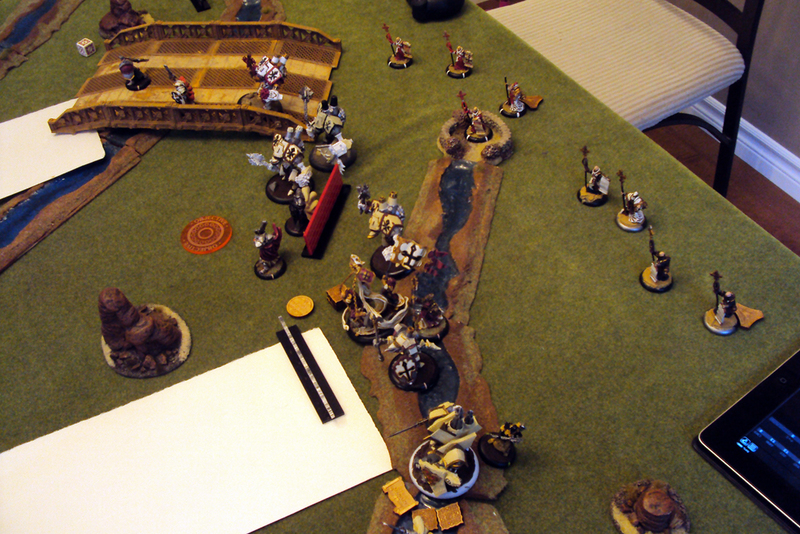 – 2nd Crusader activates, and closes the game out himself, without needing the Templar. 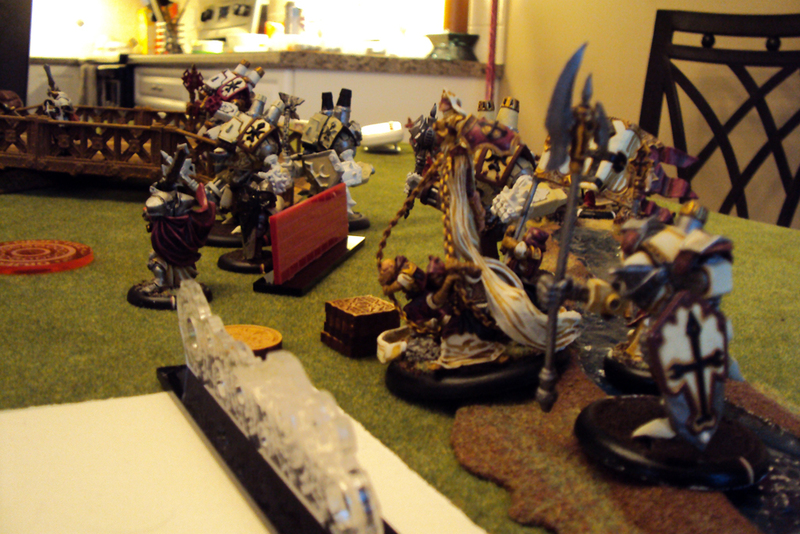 Kassem has learned that maybe, just maybe, charging your warlock at 3 full-health Menoth Heavies is a bad idea. Especially if you fail that charge! 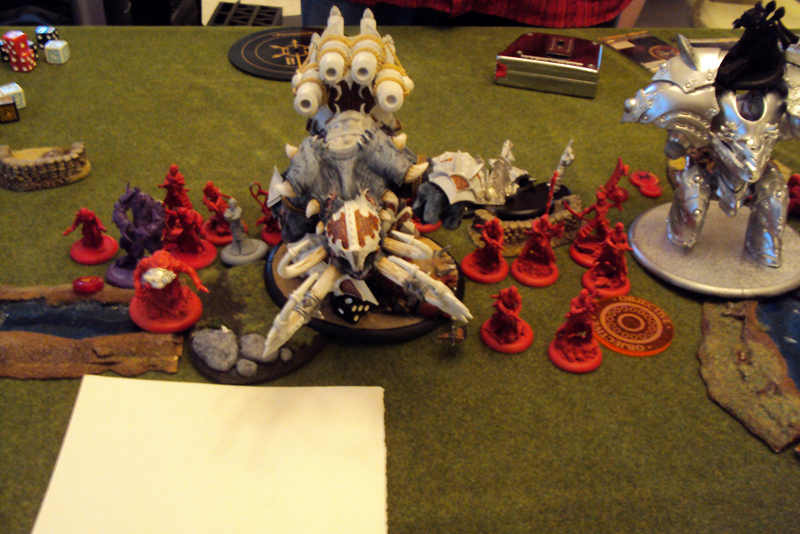 We rabbit-chased it afterwards, and Xerxis was screwed almost no-matter what. He can handle 2 Heavies with a little luck, but 3? Out of his league without bonkers-good dice. 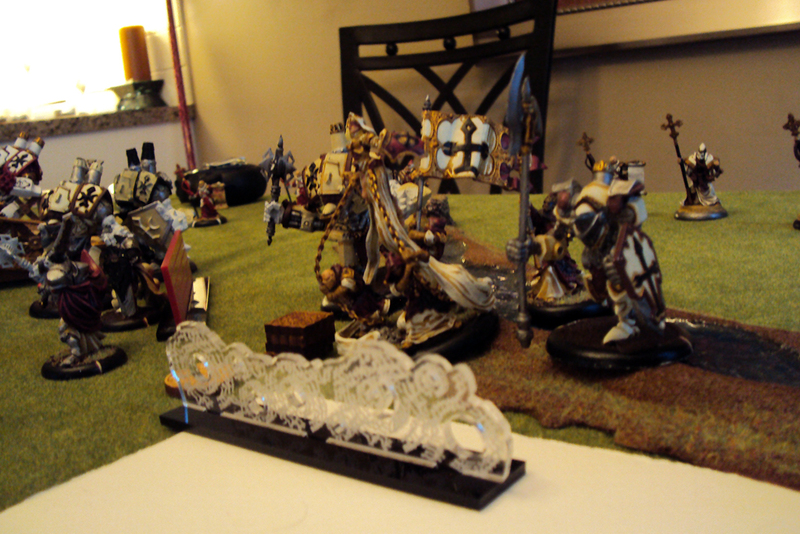 This entry was posted in Battle Reports, Harbinger, Menoth, Podcasts, Skorne, Xerxis and tagged Batrep, eXerxis, Harby, Hordes, IABN, WarMachine by Marx. Bookmark the permalink. Like most warlocks, right Kassem?